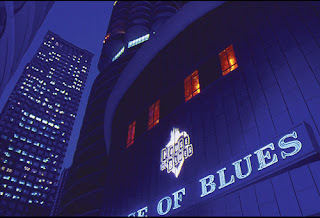 Chicago's House of Blues hosted Excelerate Labs' inaugural demo day. On August 31st, the ten startups that journeyed through Excelerate Labs' 2010 summer incubation program presented their businesses at a 'demo day' event at Chicago's House of Blues. Excelerate Labs is a summer incubation program for pre-seed stage companies. It is modeled after TechStars and similar programs. I was fortunate enough to stumble upon a ticket for the event. As it turned out, the day's presentations were as much a lesson in how to present a startup as a lesson in crafting a startup. The day started with priceline.com founder Jeff Hoffman giving a keynote. Hoffman recalled training with a world champion boxer (Lewis? ), and counting for him the number of reps. Not believe Hoffman's count, the boxer dramatically started again from scratch. "The difference between 300 reps and 299 reps is the difference between world champions and everyone else," declared the boxer. It was stark reminder of the depth of passion needed to succeed. There must have been over 150 investors in the audience, including stars such as Brad Feld. Each business's presentation was polished. In general terms, they each first started with a testimony from a stakeholder, before showing through statistics, media, customer testimonials or other evidence that there was a real problem. Where they could, the startups showed what traction they had already attained. In some cases, this was significant. None of the businesses showed financials projections, which made me chuckle - I guess the community has moved past fiction. In many ways, I could not help but feel that most (if not all) of the startups were already quite successful. The role of Excellerate seems to have been to put a magnifying glass on them, attracting substantial attention, drawing resources (such as mentors), luring investors and boosting valuations. What did I like about the startups themselves? GiveForward's viral marketing model reminded me a lot of justgiving.com's viral success. I liked Tap Me's core idea: an API that allows gamers to include sponsored in-game items; product placement for games. I liked how customer-centric PVPower's Solar-Bear seemed to be. EduLender's route to market - through financial aid offices - seemed compelling. What did I not like? One or two of the businesses are clearly closer less proven. It will be interesting to see what the next steps for these will be. The day also included a keynote from famed wine tv webcaster Gary Vaynerchuk, who was hilarious. I might be losing something in translation here, but his main point seemed to be about "giving a f**k" about customers. He declared "caring" to be the new frontier for competition. I agree. In a world of information overload, businesses have to figure out how to help the customer beyond just providing them with what everyone else is providing.